The last match of the season saw Dorset travel to Worthing, a pretty Downland course overlooking the sea. Dorset gave two players their South East League debuts, Kevin Robinson from Yeovil and Robbie Mabb from Weymouth. Things seemed to be going Dorset's way in the morning foursomes after plenty of good golf, but on the 18th hole Sussex came charging back. Tom Peacock and Harry Shaw were one down playing the last and made a great birdie to give themselves a good chance of a half. The Sussex pair then proceeded to follow them in for a birdie of their own to win one up. Our second pair of Matt Hector and Robbie Mabb then came down the last one up. Sussex again birdied to half that game. Dorset's third pairing of Giles Legg and Jon Welch also played the last one up, with Sussex had driven badly into the right hand rough. Unfortunately this did not stop them from playing a miracle six iron to four feet for yet another birdie on the eighteenth. Game halved. The back pair of Andy Windsor and Kevin Robinson lost 2 and 1 to give Sussex a 3 - 1 lead. The afternoon singles got underway in beautiful sunshine, but around the turn the weather also turned drenching us with freezing rain. This affected the quality of golf with holes being given away cheaply from both sides. Strong winds then blew the rain away giving us some very competitive golf over the closing holes. Matt Hector, in what is becoming his customary berth at number one, led us out well with a fine 2&1 win. Tom Peacock battled well but succumbed 2&1. It then became very close, with Harry Shaw and Giles Legg all square with three to play, Jon Welch one up with three to go, Andy Windsor well up in his final match for the County before turning professional and Kevin Robinson a couple up as well. Andy Windsor was the first result to come, a fine 7&5 victory, but that was soon levelled out by Robbie Mabb losing 6&5. Then came the turning points of what looked at least a halved match for Dorset. Harry Shaw pulled his tee shot on seventeen out of bounds to lose the hole and eventually his match one down. Jon Welch hit his third shot to the par five sixteenth through the green to make an untimely bogey which led to him also losing one down. This gave Sussex their seventh point and the match. Giles Legg then halved the last for a one up victory with the match already over. Final result 7 - 5 to Sussex. This was a battling performance from Dorset which will give us confidence going into next season. Our County Coach, Martyn Thompson has highlighted a few points for the team to work on over the winter which will hopefully turn next years halved matches into wins, and one down losses into halves or even victories. I believe we are close to some really good performances next year. Our best wishes go to Andy Windsor for his professional career and we thank him for his dedication to the County over the last six years. Following the 8/4 victory 2 weeks ago versus Kent, the same team travelled to glorious Sunningdale for a clash versus Surrey. Unfortunately, we were totally outclassed on a very tricky Sunningdale NEW Course loosing 10/2. The only change from the Kent match brought Dorset's SW representative Corey Coshan into the fold and he was the only player to gain a singles victory against current England International Stiggy Hodgson. The match proved to be enthralling with birdies being thrown at each other as the match progressed. Corey's talent being further confirmed as he closed out the match at the 18th. The Dorset team have played 8 league matches in 2 months (SW and SE). This match proved to be one too many and Surrey gained revenge for last year's defeat at Came Down. The Dorset players should reflect and be proud of their efforts and team spirit over this period and they will surely progress to greater things in the future. Everyone involved in the day was grateful to experience Sunningdale at its best. Thank you to Surrey County Golf Union for a wonderful day. For the full individual results click here. Having just got over SW Week and with a stag party contributing to the loss of some regulars there were new faces brought to the squad and some from the past as we welcomed back to County golf Tom Peacock after his few years on the pro circuit. Making his SE debut after a successful SW Week Harry Shaw went out first with the ever steady regular Matt Hector and this new pairing saw off a strong Kent pair to put the first point on the board. After nine it looked promising, but as the captain found in SW Week it can change so quickly as players found it tough going and with Kevin and David being pegged back from 3 up along with Tom and David what was looking like a positive result turned into a morning foursomes defeat. The lunch table could well have been the England dressing room after the Algeria match but some rallying words from the captain a little reshuffle and the players were up to turn round the morning results and I must say they did not disappoint. Matt led the way and swiftly dealt with his opponent 5&4 Tom Peacock was out second and not only did he have to deal with his opponent he was also considered by some as contributing to slow play (Captian noted not to pair up with the windz!!) this did not distract him as he was always in control and when his opponent stuck his ball in the rubbish on the left at seventeen it was all over. David found himself down by three early on but some cracking golf got him back on level and he was one up when he cut it to tight down the right of fifteen and with his opponent birding sixteen after a snap hook off the tee and a pulled second to the seventeenth saw him go down 2&1. From then on the news just got better as the remaining players less Harry Shaw who fought it out for a good halve, all won comfortably even Jon Welch who was quickly two down but turned the game around winning 6&4. The Captain and the team are to be congratulated on a great win that puts him back in contention as he ponders on the team to meet Surrey at Sunningdale. The first South East League match of the season got under way at Came Down GC with a bitterly cold NE wind blowing. The front runners Josh and Matt gelled very well for there first outing together and whilst sometimes the golf was not pretty it was effective with 6 birdies making a great winning start 6&5. The second saw four stalwarts to County golf going out and it was a good tussle with eventually Martin and Ryan just getting the better of Tom and Andrew. David Norton and Kevin Garwood made an awful start and were 3 down after four. They did however turn it around and soon after the turn went up and ran out winners 2&1. The back pairing of Jon and Giles never got going and went down 4&3 leaving the honours even after the morning foursomes. With the wind picking up and the temperature dropping the afternoon single got under way with Kevin leading the way against Darren Wright, this was a tussle with some fine golf being played by both with Darren just getting the edge 2&1. David Norton always seemed in control of his match again with both play very good golf and after the sixteenth David was dormy two but all credit to Martin who dug deep and with some good up and downs on the last two holes which sadly David could not match the game was halved. Matt Hector had a see saw came and he came to the seventeenth one down but a great shot in hitting the green meant he brought it all square and a halve on the last saw another halved game and a good days golf from Matt. With Josh and Jon going down we could not get the win and Giles then turned on the form with a splendid display and a great 5&4 win over Ryan Henley. Tom Leech fought hard to stay with Jon but came up short going down 3&2 so Hampshire had gained past the winning post and Andrew brought home the final Point for Dorset with a good 3&1 win even if it was some several holes later than the rest! Overall a disappointing result for the Captain, there were some very good individual performances which I am sure will give him hope for the future fixtures to come and overall a good performance from the team against a very good Hampshire side who we wish well in their remaining fixtures. Josh Moses Sherborne pictured on the left made his County Debut. 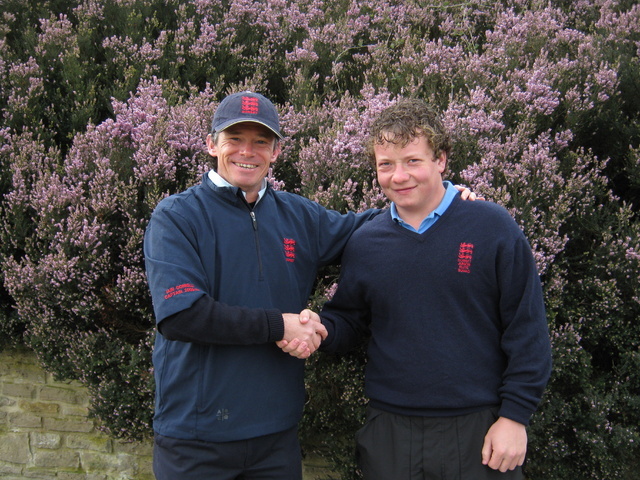 Kevin Garwood (right) has been selected to represent Great Britain & Ireland in the World Student Golf Championships in Spain in June 2010. This tournament is being used as a dry run for the Olympics for when golf becomes one of the participating sports. He is currently ranked in the top 17 EGU Order of Merit, a superb achievement helping his chances of further international honours. Dorset welcomed BBO to Dudsbury Golf Club in excellent condition for the annual friendly match. Tom Leech and Andy Windsor led the way for Dorset in the morning winning early 4/3. England University Player, Josh Moses, debuted with Jon Welch losing a birdie-fest match 2/1. In the afternoon, David Norton won strongly out number 1 winning 4/3, however, the depth of talent in the BBO side started to show winning the next 5 matches. BBO were worthy winners with both teams finding the friendly event very useful in giving new players competitive experience. Dorset now look forward to fielding their strongest team against Hampshire at Came Down in the first league match of the season. For the full result listing click here. The Dorset County First Team welcomed the Army Team to a chilly but very scenic Isle of Purbeck on Sunday. With a number of players unavailable due to Beckford Bowl commitments it was an opportunity to try a few fresh faces. It was a successful first cap for Harry Mitchell, a young 16 year old promoted through the junior ranks. His birdie in the singles showed the class that we hope he can develop and become a first team regular. The Army proved to be a solid team and were delighted to take the Dorset scalp. Finally, a big thank you and good luck to Matthew Walker who will be turning Pro after a county career stretching over 15 years. For the full result sheet click here. 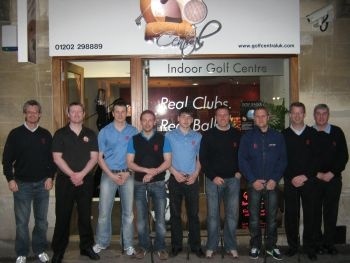 The county 1st team had the priviledge of visiting Golf Central, Bournemouth's new indoor golf centre. The players enjoyed the use of the golf simulators and the vast choice of golf courses available to play. County coach Martyn Thompson was able to give individual instruction whilst the players battled around the likes of Pebble Beach and St Andrews! A big thank you to the Golf Central team for inviting us, we look forward to playing golf their again in the near future. Kelly Goodwin, senior lecturer, and her fourth year students provided a very professional pre-season physiological (fitness) programme for the Dorset team. Two sessions each two hours long involving various fitness and stretching tests helped to create a Golf specific strength/conditioning package for each individual golfer. The individual results combined with graphs showing player performance compared to squad averages were helpful in finding key development areas for each player. A big thank you to Bournemouth Universities Applied Physiology Team for their time and effort in putting a professional programme together. It was illuminating for all the players who took part and gave them a clear understanding on what they need to work on to improve their golfing fitness levels. Dorset's 1st team squad arrived at a sunny but chilly Cumberwell Park. The 6 hour practise session proved to be a great success with 3 different short game exercises created by County Coach, Martyn Thompson for the 10 players attending. Following two months of hitting golf balls in the Iford driving range it was a welcome opportunity to gain "real play" time. Corey Coshan showed his older teammates the way with an excellent mornings chipping and sand shot play. Interestingly, he accomplished it with the same club for every shot. Martyn tested the squad with a 3 club challenge (all 3 clubs used equal amount) after lunch. This exercise helped the players to be creative with Andy Windsor and Iain Donnelly (competing for fun) coming out on top. Finally, a par 2 comp (chip + putt) completed the day. Scoring was tight with a cool under pressure Daryl McMahon just pipping a typically dilligent Tom Leech to first place. A big thank you to Cumberwell Park for the use of their excellent facilitise and to Martyn Thompson for a very professional day of short game practise. Finally, to the players for their enthusiasm and desire to wear the Dorset colours with pride. A great start to the season.